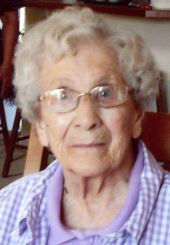 Obituary for Lydia Alma Baller | Stone Funeral Home, Inc.
Lydia Alma Baller, age 97, of Mackinaw City and formerly of Cheboygan passed away Monday, July 30, 2018 at the Hospice House surrounded by her family. She was born August 12, 1920 in Ocqueoc, MI, the daughter of Robert and Lydia (Wemert) Kortman. On September 15, 1945 at St. Thomas Lutheran Church, Lydia married Leonard “Harold” Baller who preceded her in death in 2004. Lydia moved from the family farm to Cheboygan in her early 20’s to work at the Garment Factory. She then went to work for the Hayes and Melwing families in Mackinaw City working as a waitress at Melwing’s Restaurant for more than 30 years. Lydia was most happy when her family was around. She enjoyed baking and canning for her family, tending her garden, hosting Christmas breakfast every year, knitting, crocheting and quilting. She has been a member of St. Thomas Lutheran Church for over 70 years. Survivors include her three sons, Dale (Linda) of Lansing and FL, Jerry (Jeannie) of Cheboygan and Loren (Viola) of Cheboygan, one daughter, Susan (Joseph) Caswell of Cheboygan, two sisters, Lorene Peek of Palmetto, GA and Betty (Ronald) Wenzel of Rogers City, granddaughters, Tammy (Jim) Kinsey, Shelli (Paul) France, and Sonya and Maria Baller, grandsons, Dale (Michelle), Brian (Christy), Kevin (Sue), Justin (Courtney), Jeffrey (Kristian), Robert (Stuart) and Brad Baller, Greg (Melissa) and Jason (Jennifer) Caswell, 21 great grandchildren and many nieces and nephews. Besides her husband Harold, Lydia was preceded in death by her son, Leon Baller, three sisters, Esther Appleberg, Ida Kreft and Dorothy Phillips, three brothers, August, Clifford and Robert Kortman, a grandson, Jeremiah Baller and a granddaughter, Heather Baller. The funeral service will take place at St. Thomas Lutheran Church on Friday, August 3 at Noon with the family greeting friends one hour prior to the service. Pastor Dave Hueter will officiate and burial will take place at Pinehill Cemetery. Memorial contributions may be directed to the church or Hospice of the Straits. Arrangements are being handled by the Nordman-Christian Funeral Home.